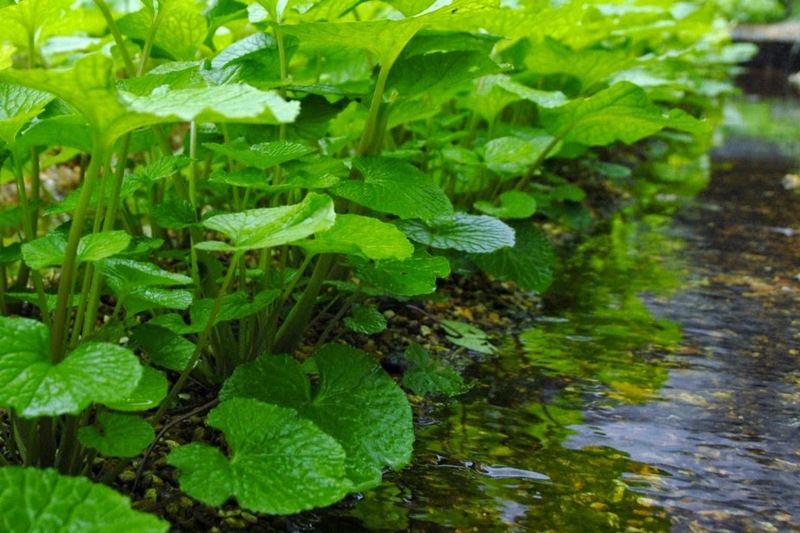 Commonly known as the Japanese horseradish, the wasabi plant - Wasabia japonica is an edible herbaceous perennial whose natural habitat is found partially submerged along mountain stream beds in Japan. Despite certain similarities the wasabi plant isn't a close relation to the European horseradish - Armoracia rusticana, syn. Cochlearia armoracia, although they are both genera of the Brassicaceae family. Conversely, in Japan the horseradish is known as European wasabi! The mature wasabi plant produces large heart shaped leaves, which protrude from the top of a swollen rhizome-like stem, holding the leaves as high as 60 cm above ground at the base of the plant. The true roots are usually submerged and firmly anchor the plant to prevent it being washed away during floods. The plant takes two years to reach maturity requiring mild temperatures and filtered sunlight. Wasabi has been apart of Japanese cuisine for thousands of years, in fact archaeological evidence has shown that the ancient Japanese were eating wasabi as early as 14,000 B.C. 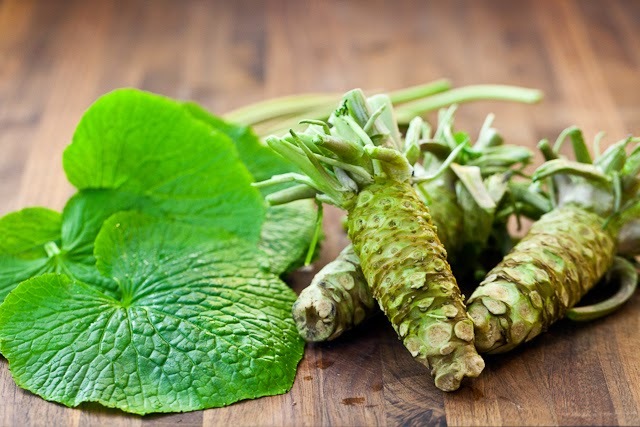 Although rare to find and notoriously difficult to bring under cultivation, the use of wasabi was widespread by the 16th century but the cost of production restricted its use to the Japanese ruling class. Be that as it may, the production both improved and increased with the rise in popularity of sushi, when wasabi became the preferred flavouring. In sushi preparation, the wasabi is usually placed between the fish and the rice because covering wasabi until served preserves its flavor. Wasabi was also prized for its ability to counteract food poisoning. When preparing fresh wasabi, remove the leaves and then rinse the stem under cold running water. It is not necessary to peel the stem, but any dark patches of skin can be removed for a uniformly coloured paste. The greenest, sweetest wasabi will be at the foliage end of the stem and this is where you should start to grate. Using a wasabi grater (known as an oroshigane), grate in a circular motion to produce a fine paste. Only grate what you need as it will lose its flavour after 15 minutes or so. You can always grate more if you need it later. 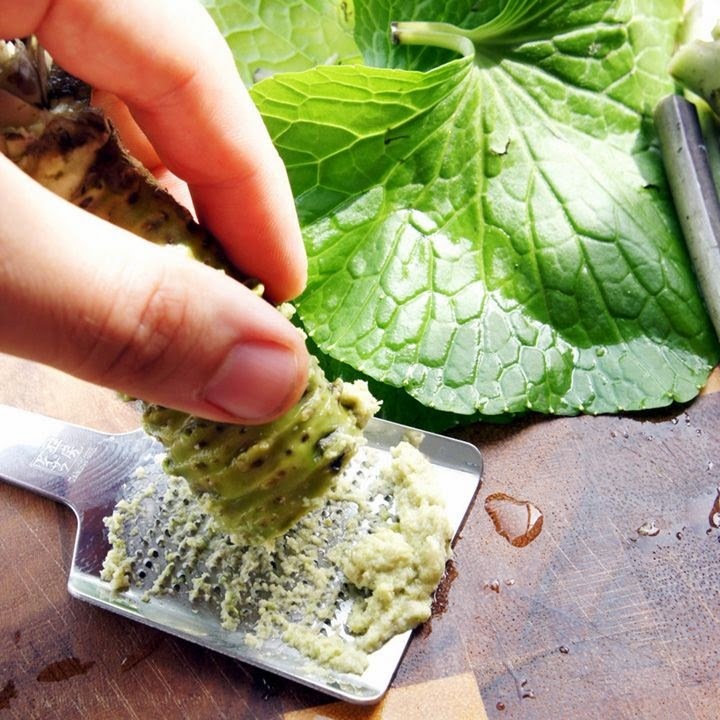 Using a wasabi brush that should have been purchased with the grate, remove the wasabi onto a wooden or ceramic surface as the steel surface of the grate will speed up the oxidation process and affect the flavour. Wasabi loses its flavour after 15-20 minutes when exposed to air so gather the paste into a ball as this minimizes contact with the air and prolongs the flavour. Let it rest at room temperature for up to 5 minutes to allow the flavours to develop, then it’s ready to serve. You can improve the flavour of an older wasabi ball by grating a little fresh wasabi onto the pile and gathering it up into a ball again. Although eaten in very small amounts, you may be interested to know that wasabi is very low in cholesterol and sodium and is a source of dietary fibre and vitamin C. Wasabi is also a good source of Vitamin B6, calcium, magnesium, potassium and manganese.